Beware the moon as Fright-Rags unleashes its An American Werewolf in London line of apparel. John Landis’ 1981 horror/comedy lends itself to four new t-shirts and four new enamel pins, including a motion pin that recreates part of the unparalleled werewolf transformation scene. 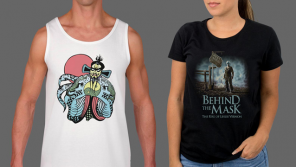 Who will survive Fright-Rags’ The Texas Chainsaw Massacre line of apparel? Imagery from Tobe Hooper’s 1974 masterpiece is emblazoned on four enamel pins, including a motion pin that emulates Leatherface’s iconic chainsaw dance from the end of the film and four t-shirts. Fright-Rags commemorates seminal horror host Joe Bob Briggs long-awaited return with a t-shirt design for The Last Drive-In, a 24-hour horror movie marathon streaming on Shudder; in addition to restocking their earlier MonsterVision tees. An American Werewolf in London, The Texas Chainsaw Massacre, and Joe Bob Briggs merchandise is on sale now at Fright-Rags.com, but remember… don’t become a victim of carnivorous lunar activities!